It started out with a great fanfare as a third-quarter flagship show. Then it was trimmed down to 2 nights, then 1 and replaced with cat videos. Now Restaurant Revolution has been bumped yet again, now moving from 8:30pm Thursdays to 9:30pm. With a two hour episode, it will be a very late 11:30pm finish for the show. 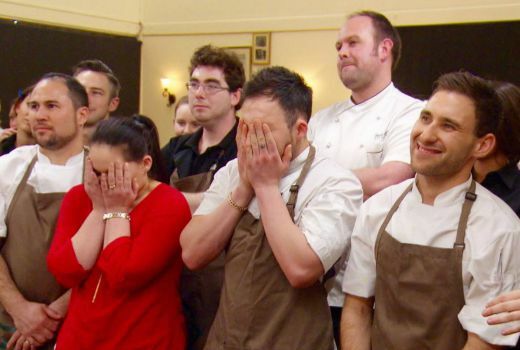 One can only speculate why the show has not been moved to a multichannel or axed outright, but there is a competition element and prize to be played out and there are undoubtedly hard-working restaurateurs who have invested much in the Seven series. More significantly, the network has advertisers and commitments (including, it would appear, local councils) who were given big promises. There have been reports the network is offering ‘make-goods’ to compensate advertisers. Sources tell TV Tonight the TV ratings do not reflect the volume of customers still attending the pop-up restaurants around the country. Sadly, they are not what keeps a show on the air. The latest move follows dismal numbers last week of just 312,000 viewers for the show -it is now replaced with a Mighty Ships special -a show usually kept on the shelf for Summer. Meanwhile tomorrow night Seven screens Dogs Make You Laugh Out Loud and next week has confirmed Pets Make You Laugh Out Loud. Update: The show is now back to an 8:30pm start. Changed yet again – the cruise ship show is out and RR is now on at 8.30pm (according to this morning’s epg). Good news for Seven – Richard Hammond is fronting a couple of specials looking at the “sciecne” behind cat clips and dog clips for National Geographic in the UK this week. Get the cheque book out! It would be similar to Channel 10’s I Will Survive and Nine’s Excessive Baggage back in 2012. This is going to be Restaurant Revolting! New show coming up for seven, “viewers who cry out loud”. Plenty of material for them to use. The Internet is full of people crying out for better programming. There are far too many reality shows on now, with cooking and renovations etc. Every channel tries to jump on the band wagon for viewer ratings but surely people can only take so much of the same thing and then tune out. Please all you channels find something else worth watching. I can live with reality but diversify. I don’t want 5 different cooking shows and another 4 Reno shows. I walked past the Brisbane restaurant last Friday night. From what I could tell, security and other people in channel 7 t-shirts far outnumbered diners. Leading a revolution is tiring work. John, Justine and Maggie (above) have been championing Brisbane’s Puerto, the Queensland Restaurant Revolution venue, for the past few months and the pressure seems to be getting to them. During a recent visit to their pop-up eatery, their usual vibrant personalities were fading. Maggie, who is normally bursting with energy, seemed to have lost her spark and young lovers Justine and John appeared to be struggling to put on a brave face. Maggie told Confidential yesterday that the pressure and long hours were taking a toll. “Yes, we do get tired. We are only human,” she said. Seven will honour the prize as they did for Big Adventure -and that was way more. But I think that was more because it was pre-recorded and not ongoing, plus the Survivor rip-off adventure didn’t sink to those lows in the ratings. They may find a way to wrap it up earlier, but I think you will find the prize is paid out. I’ve watched every minute of this show and I must admit I do not have any idea what the prize is – do you know if this has been revealed? Firstly, I like Mighty Ships and very much hope it’s a new episode. Secondly, they’re really continuing the Make You LOL series? Really, that’s the best they can do? Sigh..